My previous article was about setup Internet connection on Teracom router. Now it is the time to configure WiFi and WiFi security on Teracom router with BSNL DSL Connection. BSNL provides Teracom modem with routing facility. So, though it is a modem we can connect multiple computers to it if DHCP server is enabled on the configuration page. Setup wireless in Teracom wireless router is as simple as selecting the radio Wireless Network. In Wireless settings page we can select the proper encryption to secure its WiFi network from external intruders. This device has the facility to enable MAC Address Filtering to provide additional security. Let us check step by step how to setup WiFi security on this device. Please note that default Login IP address of Teracom Router is 192.168.1.1 but if you change that IP address, you should use the new IP address to the login setup page. Now you will be prompted to enter Teracom router username and password. Now click OK to login. Now you will be in BSNL overview page. If you are looking for steps to setup Internet on this device, click on the link below. Click on Wireless Network which located under Configuration tab. 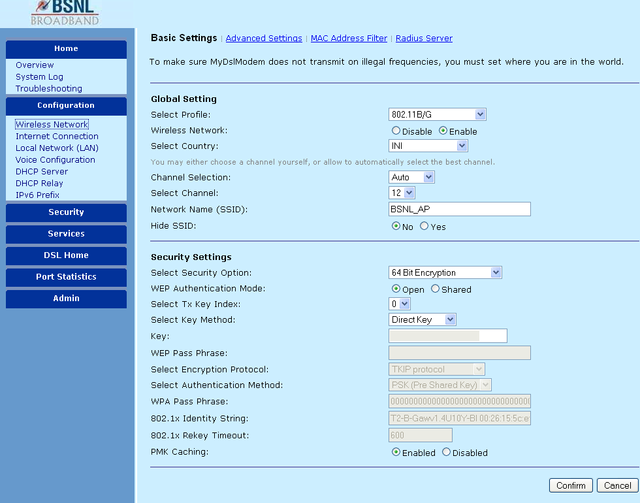 In this page, you can activate WiFi on BSNL Teracom modem. Turn on WiFi by selecting enable button opposite to Wireless Network. You can change the name(SSID) of your network by typing any name on the field Network Name(SSID). It is better to select channel selection auto because then the device will choose the best channel automatically. It supports the following encryption standards. Select proper encryption from the drop-down menu opposite to security options. If you are a home user and just need security and not worry much about it, the easier one is WEP 64 Bit Encryption. If you select this as the security option, you can type any hexadecimal number ( 0-9 and A-F) as the wireless key. Don't forget to click on confirm button. Now onwards you need to enter this ten digit key to log in to your wireless network. If you are very much conscious about the security of your wireless network, I recommend you to use WPA or WPA2. Then you should select Wi-Fi Protected Access or Wi-Fi Protected Access2 from the drop-down menu. 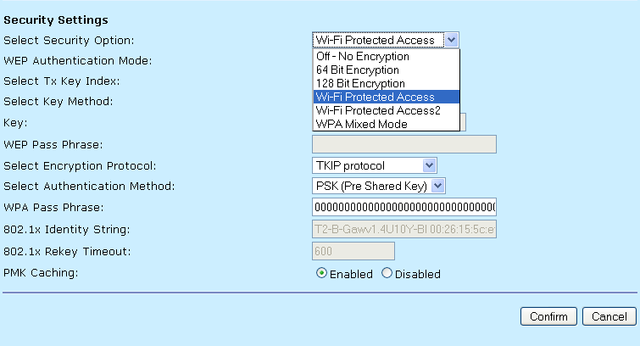 You can select authentication mode for Teracom Wireless network as PSK and enter the Pass Phrase. After this, without this PassPhrase, no computers are allowed to join your wireless network. If you are facing any issues with connecting devices to WiFi network, follow the steps provided in the link below. In this tutorial, you have learned how to configure wireless on Teracom modem for BSNL Internet connection. You have also learned how to enable wireless security with BSNL connection. Teracom modem WiFi configuration is the same for most of the Teracom models. To learn how to configure Teracom modem with BSNL connection click on the link below. The configuration step is same for most of the BSNL type 2 modems. connection esp BSNL/Airtel. No need to pay anything anymore on renting or as caution deposit for Modem/Router from your providers. Leaving for abroad and selling it just for 4k rupees. Contact me @ gotovamsee@gmail.com/+919177971000 now. Thank you for your post. To know more about teracom modem wireless settings follow the link below. Best Teracom Modem Deals. Best suited for BSNL users. Type 11 Teracom BSNL wireless Modem. Connect multiple computers using same BSNL connection. I am now using WEP 64 bit encryption in teracom modem but don't think it is enough ? Can I upgrade to WPA without any issue ? Yes, we can enable WPA protection in BSNL Teracom modem. While selecting the wireless security settings you should select Wi-Fi Protected Access (WPA) and create a pass phrase for it. I always recommend you to enable WPA in your Teracom modem than enabling WEP in it. WPA is more secure compared to WEP. Portable Play Station is compatible with 802.11B standard only. Please set your wireless network to 802.11B only and try to connect to the network. If still your Portable Play Station is not connecting to the Teracom wireless network, you may degrade your wireless security to WEP. It is because WPA sometimes shows compatibility and connectivity issues. error comes access point not getted what i have to do ? Could you please explain a little bit more about your issue? 1. Disable the security (wireless encryption ) and try to connect. 2. Change the Wireless network Name and Wireless channel. I recommend you to follow the thread for more help. can i connect MTS net connector through USB by teracom bsnl type 6 modem ? through USB by TERACOM BSNL type 6 modem ? if yes what shal i do ? Can you elaborate your question a little more? I have done the Terrcom MODEM LAN Configiration as mentioned. The lan is enabled in my laptop. and the connection is through but I am not getting the web page. and check whether you type the correct user name and password given from BSNL. If you type wrong user name or password while configuring the teracom modem, you will not be able to access Internet. I am new to BSNL, I did set upthe Lan and it is perfect. but Wireless I couldnt figure out what the issue is. Please select channel 1, 6 or 11. "the network did not assign a valid ip address in a given time .you may not have connectivity to network"
I recommend you to go through the following post. Thanks a ton.. I was able to set up my internet connection. Your blog was really very helpful. I am happy to see this post helped you. Thanks Gopi for adding value to this post. WEP 64 bit encryption can use Hexa decimal keys and it should be 10 digits. Thanks for pointing our Rev's key's error (11 digits ). Thanx,that was pretty neat.My need is slightly different and i wonder if you can provide any input to me in this regard.I have Type 2 Teracom wireless Modem and i intend to do port forwarding,as i dont know nothing about port forwarding,i am unsure about what other details to provide you with,in case u require more details,kindly specify. You can find port forwarding option in BSNL Type 2 teracom modem under security tab. If you select the option direct key, you should manually give a 10 digit hexa decimal key. I have got a wireless printer (Dell V313)which I am not able to pair with the network. I have a wireless internet connection and a wireless enabled laptop (Dell). I am could connect my laptop to the internet without any problem. But my lap is not getting connected with the printer. The printer's WiFi signal is searching for signals but it is not able to find a device. Do I need a router for connecting the printer wirelessly? Hope I have not confused too much? Your Wireless Printer should have an IP address if you want to access printer from laptop wirelessly. So I recommend you to add a static IP to your printer in the same IP range of your Access Point. Then your printer may connect the wireless network. Please follow this step and if the issue is not fixed write back with details about your network diagram. Thank you Siju for the suggestion. To be frank, I never understood what you suggested to do. However, I tried to connect through the modem and it worked..
Eearlier I was trying to connect the printer directly to the laptop; in vain. Now, I switched on the wireless modem ( It is a router as per the Dept JTO), the printer and the laptop and tried to set up the printer as per the installation procedure. The printer got connected. Anyway thank you for the suggestions. When I typed 'admin' as user name and password, a message ''authentication error'' is displayed. what will be the reason? please help me. I am glad to see that your issue is fixed by yourself. Authentication error means you typed a wrong combination (or wrong)of Username/password to login your BSNL modem. Even when I typed the username and password as admin correctly, it shows authentication error. thanks a lot dude.....god bless!! Hi... I'm trying to connect to wireless on the terracom but it doesn't get past authenticating. I turned of authentication but it still doesn't connect. I've never used wireless so far on this modem. What could be the issue? user name: "admin" and password: "admin" does not work it seems. the dialog box, just keep me asking the username password. can you just a alternative way? Have you created a wireless key for the wireless network from teracom modem ? I recommend you to follow the steps provided in the link below. It seems you configured your Teracom modem with custom user name and password. Try to find the right user name and password or you have to reset the modem and reconfigure it. To know how to reset a modem, follow the steps in the link below. Here is one link which will help you for the same. thanks Siju... I finally figured out the issue. The Mac filter was set to whitelist. Once I disabled it... it connected like a charm. I am happy to see you fixed the issue by yourself. It is normal, modem produces heat while it is working. So better make sure there is a proper air circulation. If you find hardware issues with your BSNL modem, you should contact the local BSNL exchange. They will either repair or replace your faulty modem without any additional charges since it is under warranty period. I have a Teracom BSNL NON-Wireless CPE/Router. I have connected a DLink Access Point to one of the four lan ports on the BSNL Router. I am able to connect to the DLink Wireless network from my wireless laptop, and dial the internet from the BSNL dialer and then browse. The 192.168.1.1 doesn't open the Teracon/BSNL webpage. I get a DNS error. I want to configure the DLink AP to autodial the internet whenever someone tries to browse a website after connecting to the DLink Network. Please help with steps as I am not networking guy. For wireless issues please follow the steps provided in the link below. Wat is this.. It shows blank in my configuration page..
To know more about port forwarding in BSNL modem, click on the link below. In order to configure your BSNL modem in mts broad band connection, you have to have the configuration details from mts broad band customer care. Though some values are different the configuration of the modem is similar to the above post. Can you tell me what error you are getting when you try to connect to the Internet? Is it a wireless laptop or connecting with an Ethernet cable ? i have bsnl teracom wifi router and i have got a new MTS usb modem. how can i configure it, kinly do a favour to me. You cannot direct connect MTS USB modem to Teracom wifi router. However, using ICS you can provide Internet to Teracom and use it as a Wifi AP for other computers. If the default combination does not works, you might have configured a different user name and passowrd. So please try to remember that other wise the only option is reset and reconfigure the modem. But after reset you will loose all previous configuration. Can wifi be set in such a way that it will work only during specified hours. i.e. say 2 pm to 4 pm. I couldn't find any options in Teracom modem to accomplish the specified need. How much money I should spent to buy this teracom modem? Is this modem free from BSNL ? If yes what I should do to get modem free from BSNL ? who ever you are .. you are awesome! m getting msg again n again- connection to server 192.168.1.1 failed. If you are not able to access modem with 192.168.1.1 IP address, I recommend you to follow the steps provided in the link below. Thanks I was looking for a way to secure the wireless in BSNL modem. They didn't tell me how to secure the wireless and I know my neighbour was hacking my BSNL wireless Internet. With your steps I stopped him. Thanks to solve my problem. I have a teracom modem and I have configured it according to your instructions on this blog. Also I have enabled the wireless on the modem and done all the settings. Now both my laptop and desktop connects to the internet at the same time, one through wireless connection and other through LAN cable respectively. Usually I used to connect my desktop to internet by using a username n password but now after all the above configurations I don't have to use the username n password to connect to internet and the desktop connects automatically. The problem is that while I am connected to internet via wireless on my laptop I don't want the desktop to connect to internet directly without using username and password. What settings do I need to do so that my desktop doesn't connect to internet directly? You may reset the modem and do a power cycle to fix it. After this you should try to update the firmware. Doing PPPoE configuration, the user name and password are saved in modem and so you do not need to type them again to connect to Internet. Thats why your Desktop and Laptop connect to the Internet automatically without asking the User name and Password provided by your ISP. If you do not want this facility you should delete the PPPoE configuration and perform a bridge connection in your modem. So you should select bridge instead of PPPoE while configuring modem to ask the desktop before connecting to Internet. My android phone gets connected with Teracom WiFi modem, but not accessing internet. What settings are required for accessing internet? First step is to verify whether other computers connected to Teracom modem are going online? Please verify Internet configuration in Teracom first before start troubleshooting your Android phone. Hey Can you tell me how can I setup this BSNL modem? It is from Teracom as you mentioned here. I'm havin dis bsnl modem...is it possible to giv other wifi connections lyk beam....? If you are not able to join Teracom Wireless network, please click on the link below. have a query... about the teracom modem... the broadband works just fine.. i wanted to enable the wireless network and that happened well too.. though when i click on connect to the network, it shows an error.. on troubleshooting, it says "investigate router or access point issues".. kindly help..
You should make sure that Teracom modem is running on latest firmware version. If the issue persists flash the firmware. Is your wireless working fine with other devices ? May be another wireless network is saved in your galaxy in the same name. I recommend you to change the wireless network name (SSID) from Teracom modem and then try to connect to the new network name from your phone. If you forget your BSNL Modem password, please try the solution provided in the link below. Hi I am looking www.teracom.in but it says page cannot be displayed! any help? If you are not able to login to Teracom modem either your password is incorrect or you need to clear the cache and cookies in your browser. How to Connect Dongle in this Modem? We cannot connect dongle to Teracom modem now. I am having the bsnl Teracom router installed by bsnl personnel. Initially the wifi was strong and no problem. But after a week the signal become very poor and unable to connect through wifi but through Ethernet card it is working. How to solve wifi problem. Even bsnl guys cannot restore wifi connection. Pl help. Can you access the Wireless network from your BSNL router using other wireless devices like SmartPhone, Laptop etc ? If no, then the issue is with Teracom router. Check the following facts first. 1. Are you using any wireless devices like cordless phone in your home ? If yes it might cause interference. 2. Have you updated the firmware on Teracom router ? i don't see Wireless network option under configuration tab. what should i do ? When i give 192.168.1.1 on browser , i am unable to see Wireless Network option under configuration tab .. what should i do ? Hi Sachin, Can you write the model number of your modem ? Perhaps your modem does not have wireless feature. I don't think Teracom modem provided by BSNL supports network printer. Can you give me the exact model number of your modem ? Hi! Can I use The Teracom Modem in Wifi Station Mode other than the AP Mode? I do not think you can configure Teracom modem in station mode to accept signals from other APs. for that I am not able to entering to the tab it stock in the wifi page after selecting the language page. all my phones including a Samsung s3, tab and also my laptop all switch automatically connected to the wifi router. I wake up in the morning and just press again the connect button. Bingo...it is connected..!!! Not understand why it is behaving like this. I am not done any changes in routers settings also. Is it not connecting b'coz the routers frequency mismatch or anything else ?? From the details of your comment, it is clear that the issue is at your Nexus 10 side. I recommend you to follow the steps provided in the link below. I recommend you to follow the instructions provided in the link below. Are you trying to connect via wireless or Ethernet cable ? If it is a wireless connection, I recommend you to follow the steps provided in the link below. Seems a strange issue. Since the modem is giving connection to two devices (except two android phones)at the same time I think the routing feature is working fine. I suggest you to update the modem firmware and check for the issue. To download firmware, you might contact BSNL customer care. I recommend you to follow the steps mentioned in the link below. I have a samsung galaxy a5 and teracom BSNL modem. My phone's wifi not obtain the IP address and not connect with wifi. I m so worried about this... other wifi connection are connect but above teracom bsnl modem is not connect. I suggest you to follow the instructions provided in the link below. If this modem (Teracom T2-B-Gawv1.4U10Y-BI) is supplied by BSNL, you can follow the same instructions provided in this tutorial to enable and setup WiFi pasword. Under Wireless , you can change the current wireless password by changing the passphrase. For which model of Teracom WiFi router you want to limit the download speed ?